When it comes to working on a 9 to 5 job, there are a lot of candidates who are willing to take up the opportunities available to them. In the crunch and pressure economic times, people are dearly looking for jobs and they cannot think of any other avenue to explore. When we talk about the future and income, there are two major schools of thought. One is the fact where people prefer to work for a company or a brand as an employee with set rules and timings and a fixed income. The second school of thought is about owning something and being responsible for it and working hard to make it a success, this is where entrepreneurship comes in. The idea of being an entrepreneur is not everyone’s favorite cup of tea. It requires a lot of patience and ability to work hard with resilience which cannot be defeated by upsets and hiccups that are bound to happen when you run a business. This is the reason there is so much difference between the roles an individual performs on the job which is set on different rules and protocols and someone who owns a business, runs it round the clock and is responsible for it. It must be noted that people who have the flair to do jobs cannot easily become entrepreneurs as it requires a completely different mindset. 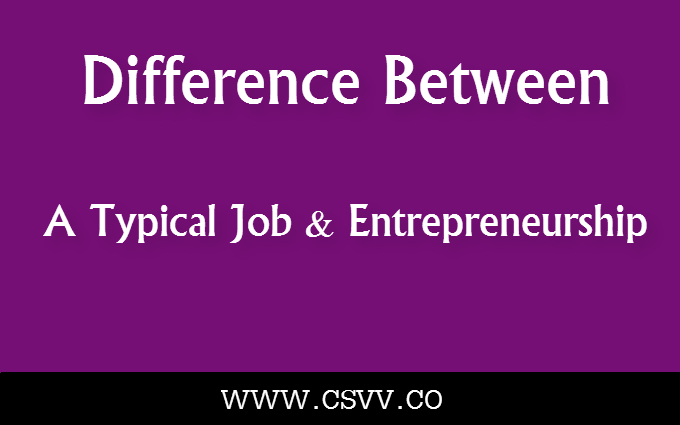 Today’s blog post is going to talk about the major differences between a typical job and entrepreneurship. When you run a business, especially when it is in the growing stages and the struggle phase is still on, you never know how much and what kind of income you will get. There is no fixed amount when it comes to your paychecks and monthly income. This is why entrepreneurs, sometimes will earn like a millionaire and during bad times, their janitor will earn more disposable income than them. When you are working on the job, you always have a set income which is credited into your account towards the end of the month. One of the biggest reasons to work on the job and not the business is the guarantee of income you will receive and people prefer that in the modern day times. When it comes to business, an entrepreneur will always decide the rules and no one is going to stop him. Whereas when you are working on the job, you will be given a set of protocols decided by your manager and your company’s policies. You will have to adhere to strict rules of timings, dressing and working. When you are an entrepreneur, you will never have to worry about these things in your life as they are just the casual decisions you do not have to take. An entrepreneur will perform more than just one set of roles at work. He can be the CEO and in the same day, he will also be a salesman. However, when you are working on the job, you will be given a set of expectations in the form of a job description and all you have to do is just managing to clear those expectations through your work. You will not be adhered to perform any other role than is given to you in the company. Business people do not care how or who does the job, all they care is that the job should be finished in time and there should be profits to be made. While on the job, you have to work with set principles and there is no profit. Jacqueline Smith is the author of this blog post. Jacqueline works as a businessman, who once was employed by a top organization. She has been working for some of the best custom essay writing services in his free time along with posting blogs on the site CorrectEssays.com. Her blogs are widely appreciated by the users who are actively reading it online.